South Korea, Brazil, Switzerland, etc.. 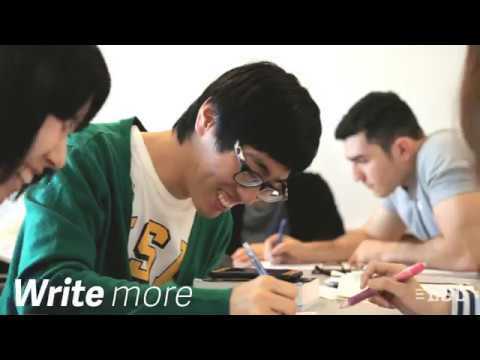 Located in downtown Vancouver, a stone’s throw from the public library and public transport links, our partner school offers an exceptional learning environment to study the English language. Its bright and spacious classrooms are the ideal setting for interactive lessons, taught by passionate and qualified teachers. Between or after classes, international students can enjoy the comfortable student lounge for a coffee break or a snack in a pleasant atmosphere (vending machines available for student use). A flat-screen TV will allow you to watch series in English with the other international students, whereas the individual study room is the perfect setting to review your lessons in a calm and quiet environment. You can also use free Wi-Fi and the many computers available for students' use. The school staff will be at your disposal in the reception area, to welcome you and to provide you with support on a daily basis. Perched on Canada’s west coast surrounded by forests and mountains,Vancouver is the perfect setting for a gap experience. After you’ve built up your confidence with a general English course, the perfect capstone to your time abroad is an official exam certificate that will help your CV arrive to the top of the stack every time. Choose from the Cambridge FCE, CAE, CPE, the IELTS or the TOEFL, and get the preparation you need to pass your exam of choice with ease. Last summer I spent 5 weeks in Vancouver to improve my English and it was an incredible experience. Apart from the fact that the country is truly amazing, EC Vancouver welcomed me in the best possible way. Upon arrival, all the new people went to have dinner together and visit the city, which means that you’re not alone for long; in my case, I met a group of 10 people that day, and we spent the whole stay together! (and we are still in touch!). The nationality mix and the learning method gave me a lot, and the school staff recommended us the best excursions in British Columbia (Victoria, Rockies Mountains and much more). So many good memories; I want to go back! Discover the famous Canadian hospitality with a host family from Vancouver. In a friendly and safe environment, a maximum of an hour from the school by public transport, you'll stay in a single room, with an optional private bathroom, and will have breakfast and dinner with your hosts. Carefully selected, these families reflect the great cultural diversity of Canada and will open their homes to share a unique experience with you, that will allow you to practice your English every single day! Note: It is compulsory for students under 19 to stay in a single room, to book airport transfers and require a parental consent form. Students should also provide a custodianship letter if requested by the Embassy. A few minutes from the bars and restaurants of Davie Street and only a 15-minute walk from the school, this residence offers shared apartments featuring single or twin bedrooms. You will share 2 bathrooms, the kitchen and the living room with your flatmates. Bed linen is provided and a laundry room is also available. Use the free Wi-Fi or watch a movie with your friends thanks to the streaming service! After classes, get fit at the gym and relax in the sauna. You’ll be amazed by the beautiful views of the city and the sea! APT Co-Living superior residence( minimun 2 weeks) Have a social experience at this great Vancouver residence, about 20 minutes by bus from the language school! Enjoy your privacy in an ensuite studio with a futon bed that folds into a sofa (sheets included), as well as a kitchenette, free Wi-Fi and a balcony. When you feel like seeing your fellow residents, you can hang out in the swimming pool, hot tub, sauna, games room or garden, play a game of mini golf onsite or use the barbecue facilities. Other perks include air conditioning and bike storage, so you can take to the city on two wheels! The residence is situated one block away from Davie Street, one of the most exciting neighbourhoods in Vancouver with fantastic nightlife, restaurants, cafes, and Sunset Beach just a short walk away. There are supermarkets and excellent transport links nearby. Robson Street, the city’s most popular shopping hotspot, is also just a few blocks from the residence. It can be book for 1 student travelling alone, but he/she will have to share the room whith another EC student. Vancouver beaches, mountains and parks provide an ideal setting for all outdoor sports lovers. In winter, hurtle down the slopes of the Whistler Olympic Station. In summer, discover the vastness of Stanley Park by bike or go hiking in the mountains. Throughout the year, you can also visit the city's museums, stroll along Chinatown, take a ferry trip to Victoria, the capital of British Columbia, or explore Granville Island and its colourful markets. Between the months of April and October, you will be offered another great Vancouver attraction: a whale watching experience. Together with the other international students of the school, plan your trips in the city and in the surrounding region and make the most of the legendary Canadian hospitality in an exceptional natural setting! 185 students rated this school. See the testimonials of former students.